Move over Chattanooga, there's a new violin bike in town. This Sunday, art bike team leader, Liz Hornik, Art 120's Kate Warren, and our student met to get her replacement bike ready in time for next week's River Rocks experience, the Art Bike Brigade. Our student's (AG's) bike was stolen within a week of its debut. While her bike never turned up, AG was ready to get back on and ride. 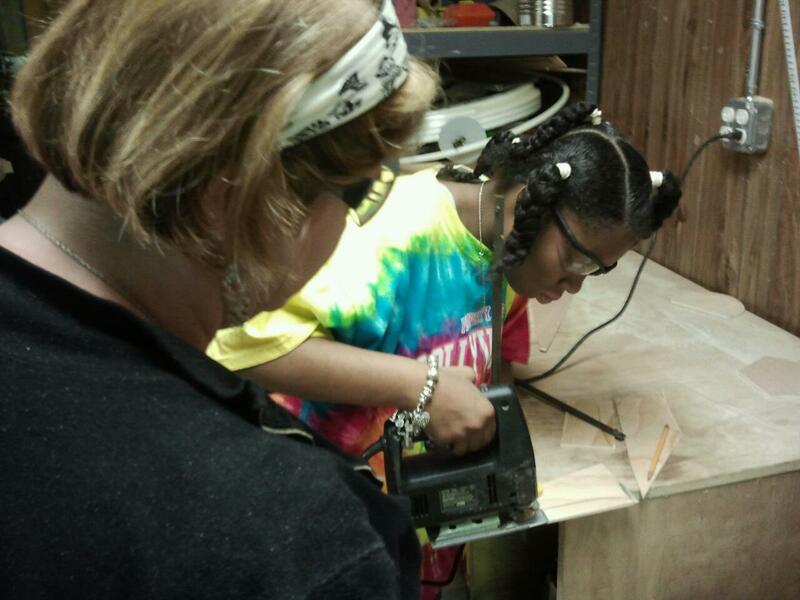 This time, our student traded in metal for wood and learned how to use a jigsaw to get her new sculpture well under way. On Saturday, October 8th from 10am-6pm we will have the art bikes on display in Cooldge Park. AG will be there too, putting the finishing touches on her violin before it debuts in the brigade ride on Sunday at 1pm in front of The Tennessee Aquarium. Please come out to see her work. We are very proud of her!